"The rich flavor of chocolate combines so well with peppermint. This is the perfect drink to sip while trimming the tree." Bring on the holiday cheer with the perfect drink to sip while trimming the tree. A nice change from the old standard, but not spectacular. Make sure you use whole milk -- I tried to get by with the skim milk I had on hand, and it just wasn't quite right. Strong chocolate flavor, but the peppermint flavor was very subtle. 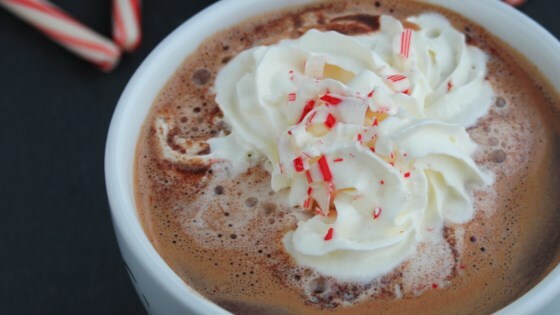 i made it with instant hot chocolate and crushed the hook off of a candy cane and then stuck the rest of the candy cane in the drink and it tasted great! This was great my family drank it on new years eve! Just suited for a cold winter day.Quite tasty indeed!